A land as old as time itself. A fishery equally as established. Famous for its trout and salmon fishing, visitors from all over the British Isles and Europe make annual pilgrimages to Connemara to fish their favorite rivers and lakes. But, Connemara offers a lot more than great fishing, and it's an ideal place for a non-angling spouse or partner to vacation. Non-angling companions can visit the picturesque villages of Clifden, Cleggan and Roundstone, tour historic sites and ancient ruins, view the beautiful gardens at the Kylemore Abbey, ride a Connemara pony (which are actually large, handsome horses) across sandy beaches, and hike well-travelled trails over the mountains and bogs of Connemara National Park. Shoppers will find a large selection of Celtic jewelry, Irish woolens, Aran sweaters, local pottery, and regional art and antiques. Pubs everywhere serve hearty "pub grub" and feature traditional Irish music in the evening – and upscale restaurants in Clifden and Roundstone serve spring lamb, Irish beef and local seafood. And where else can you walk into a pub wearing wet waders after a morning of fishing to order a platter of fresh-shucked oysters and a pint of Guinness for lunch? Despite its compact size, there are so many fly-fishing opportunities in Connemara that it's difficult to recommend a place to start. Most of the fisheries in Connemara are networks of interconnected lakes ("loughs") and rivers that hold resident brown trout and host seasonal runs of Atlantic salmon and sea trout (anadromous brown trout – often called "white trout"). Some of the larger lakes also have populations of hold-over sea trout that grow quite large – upwards of 5 lbs. or more. When these large brown trout turn cannibal, subsisting on a diet of their smaller brethren, the Irish refer to them as Ferox trout and hold them in understandably high esteem. The water in most of Connemara's lakes and rivers is quite acidic owing to the granite bedrock and the rain and runoff that filters through vast acres of peat. Lough Corrib, which forms the eastern boundary of Connemara, is an exception because it has a lake bottom composed of limestone, so it's quite fertile. Lough Inagh has several underwater seams of limestone, which buffer that water a bit. But otherwise, most of the water in Connemara is relatively infertile, so the trout are fewer – but considerably less picky about the flies they eat! Many fly anglers from North America think fly fishing from a boat in a lake is inherently less interesting than river fishing. This is certainly not the case in Ireland (and Scotland) where windy conditions lend themselves to two unique fly-fishing methods: traditional lough drift fishing and dapping. Both techniques are described in detail on the “how to fish” section of site. Each method takes advantage of the wind to propel a boat over known holding water (guided by a ghillie or boatman) while the angler manipulates one or more flies across the surface of the water downwind from the boat. The flies dance and flutter on the water's surface, which result in very exciting strikes by both brown trout and salmon – often quite close to the boat! The river fishing is similar to any most fly anglers have experienced at home, except you will stand on stone casting platforms (known as "butts") and walk in the footprints of anglers who fished those same spots over 150 years before. You'll also break for lunch at a nearby pub to enjoy a warm fire and a cool pint of Guinness with your sandwich. With that in mind, we provide in this section a list of the most popular spots, with a summary about each fishery, and information on who to contact. Any attempt to precisely define the boundaries of Connemara is sure to provoke a lively discussion, with many theories, traditions and historical references. But from a practical standpoint, it's all of County Galway that lies west of Lough Corrib. Some people also include a slice of southern Mayo, just across beautiful Killary Harbor, and others will incudes the western end of Lough Mask. But no matter how you describe it, Connemara packs a lot of rugged beauty and some world-class fishing into a compact, easily accessible region. 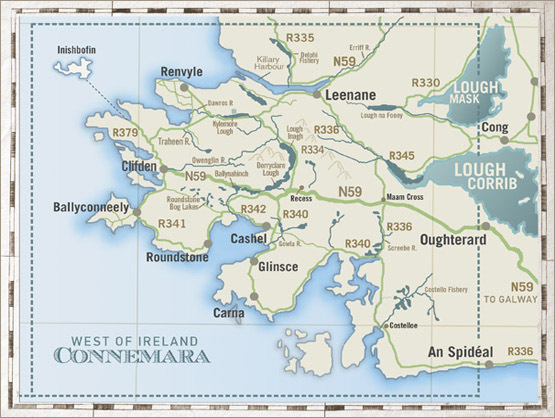 The drive from Oughterard on Connemara's eastern boundary to Clifden to the west takes only 50 minutes -- and a drive from Roundstone north to Leenane only 40, But in doing so, you cross enough rivers and pass enough fisheries to last a lifetime of exploration. The rental car agencies' parking lots are located a short minibus ride from the airport, and they're very close to the airport exit. 1. Follow the signs to M1, and turn south "ath Cliath/Dublin/M50". 2. At the first exit, turn west to M50* "to N2/N3/N4/N7/N11/N81. M50 is the toll road (called a "dual carriageway") around the perimeter of Dublin. 3. Take M50 west to Exit #7 and exit on Lucan Rd/N4 west "to Baile Pharmar/Palmerstown". N4 quickly becomes M4*, another toll road. 4. After about 25 miles on M4, take the clearly marked exit for M6 "to Galway". 5. M6 becomes N6 at the outskirts of Galway City where you will encounter the first of six different roundabouts that you must maneuver while you drive around the north side of the city. This can be a little confusing, so ignore the city names on the signs for each roundabout exit, and focus on always taking the exit for N6. 7. At the west end of Galway, watch for the exit to Clifden Road/N59 "to Clifden". 8. Stay on N59 until it ends in Clifden. *M50 and M4 are toll roads, and some of the toll stations simply photograph your automobile's license plate. Most of the rental car companies will pay your toll and bill you later, but make sure to ask how to handle the tolls when you pick up your car – you may have to pay them online when you arrive in Connemara. Any toll booths that require cash payment (euros) also take credit cards. Your rental car will be delivered to the front door of the airport, and the airport access road is clearly marked. 1. Follow the signs to M18 and turn north. 2. M18 converts from a dual carriageway to a two lane highway about half way to Galway, where it's renamed N18. 3. Take N18 to Oranmore on the outskirts of Galway City. a. Follow the signs "to Galway City" at the first two roundabouts, ignoring road numbers. b. Follow the signs "to N6" from that point on, ignoring city names. Maps: We recommend buying a Michelin road map of Ireland #712 before you fly to Ireland. It will not only help you plan your trip, it's much more detailed and useful than the maps provided by the rental car agencies. But, the Michelin map does not provide names or numbers for most rural roads, so we rely on the "The Official Road Atlas of Ireland", published by the Ordinance Survey Ireland, for exploring the back roads. It's available from most convenience stores and bookshops. GPS: GPS units are available for rent from the rental car companies, and if you already own a Garmin GPS, you can purchase a map of Ireland chip from Amazon at a nice discount. While we personally think talking GPS units are an annoying distraction most of the time, they can be invaluable when negotiating poorly marked road intersections in cities and larger towns – especially when the GPS display visually shows you which lane of a roundabout you should be in. broken only by the sound of trout sipping flies. Perhaps the most unusual fishing in Connemara is on the dozens of glacial lakes that dot the 25-square mile Roundstone bog located between the villages of Roundstone and Clifden. It's a remote, lonely wilderness fishery with a panoramic view of the spectacular Twelve Bens mountain range that serve as a backdrop. You can access the upper lakes on foot by hiking up the old Galway/Clifden railway grade starting at the railroad bridge downstream from the Ballynahinch Castle Hotel (don't try crossing the river over the bridge, however, because too many of its planks are missing or rotten. Cross at the stone road bridge just upstream and take the footpath that begins at the gate 100 feet farther to the west). When you reach the bog, you will be quickly surrounded by acres of sedges, purple moor grass, bog myrtle and wildflowers interspersed with granite outcroppings covered with lichens and heather – for as far as you can see. On either side of the old railway grade, a sprawling network of small lakes and interconnecting streams, known as the Toombeola Loughs, drains the eastern half of Roundstone bog and empties into the Ballynahinch River, providing critical spawning gravel for returning sea trout. The lower lakes in the system can also be accessed by footpath north of the road just west of the Toombeola Bridge. Directions and fishing permits can be obtained at The Anglers Return, a guesthouse just north of Toombeola that manages the fishing rights to the area. The Toombeola Loughs offer very private fishing for native brown trout – with a small run of sea trout in the lower lakes in July – in an environment so secluded that you can fish all day without seeing another person. The fishing is good, too, with brown trout that run one to two pounds and fight like they're chased by the devil himself. Further to the west, the Ballinaboy river and lake system drains the far side of the Roundstone bog and flows into the Atlantic Ocean, not far from the monument commemorating two British aviators who crash-landed the first non-stop transatlantic flight (from Newfoundland) in 1919, seven years before Lindberg's crossing. John Alcock and Arthur Whitten Brown survived the crash, won a £10,000 prize and were knighted by King George V for their achievement. Three of the better trout lakes in the Ballinaboy system, which can be easily fished from their banks, include Lough Fade, Lough Scannive and Lough Naweelaun – and permits to fish them are available from Stanley's fishing tackle shop in Clifden. The Toombeola Loughs are a small part of the huge Ballynahinch River system, the largest and best-known salmon and sea trout fishery in Connemara. Three miles of the river and adjoining Ballynahinch Lake are managed by the Ballynahinch Castle Hotel, where the fisheries manager, Simon Ashe and their staff of experienced ghillies are ready to serve both their hotel guests and visitors every morning. The Ballynahinch River is 2-1/2 miles long, wide and deep, with eight salmon beats and four sea trout pools, plus excellent brown trout fishing downstream from the hotel. Beats may be shared by two anglers and are rotated at noon. Over 70 stone casting piers, built by an Indian maharaja who owned the castle in the 20s and early 30s, allow for easy casting while wearing waterproof boots instead of waders. 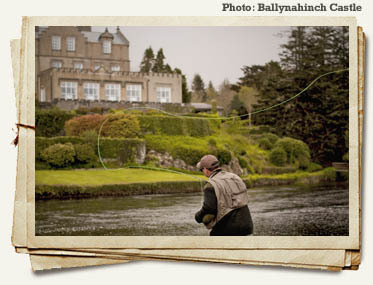 Primarily a salmon fishery, with a strong run of grilse in June and July, the Ballynahinch offers good sea trout fishing during summer evenings – as well as brown trout fishing on Ballynahinch Lake and (stocked) rainbow trout in a smaller lake nearby. Beats are available for a full or half day on a space-available basis if you are not a guest of the hotel. One of the high points of a visit to the Ballynahinch is lunch in the hotel's historic fishing pub. There you can sit surrounded by oak paneling and angling artwork and artifacts while warmed by a crackling fire as you sip a pint of Smithwick's or Guinness and eat your sandwich. The hotel also rents fly rods and reels, wellington boots and waterproof clothing – and has all of the most productive flies for sale. As you travel upstream from the Ballynahinch Castle fishery, you enter a spectacular wilderness valley, with two pristine lakes and connecting rivers that offer exceptional fishing for salmon, sea trout and large resident browns. Lough Inagh and Derryclare Lough are flanked by the towering Twelve Bens on the west and the jagged Maumturk mountains to the east, and one of the few man-made structures in sight is the beautiful, lakeside Lough Inagh Lodge, which manages the fishing rights to both lakes and connecting rivers. Originally built in the 1880's as a fishing lodge for a London brewer, the hotel owns over 5 miles of lake and river fishing. The lodge's head ghillie, Colin Folin, is an exceptional fly caster and instructor, as well as a wonderfully entertaining Irish raconteur. He'll regale you with stories and jokes and, if you're lucky, will instruct you on how to properly traverse an Irish bog and quickly detect any "floating" sections where the only thing between you and a surprise dunking is a thin layer of peat. Some of the best trout and salmon in Connemara are caught from handsome 19' wooden boats, and the Lough Inagh Lodge keeps six in their historic boathouse. Traditional lough-style drift fishing can be very exciting because the strikes are often quite explosive – and occur so close to the boat. It's especially exciting on lakes like Lough Inagh that hold native trout that average 3 to 4 pounds and salmon far bigger than that. The Lough Inagh Lodge also offers four river beats, the most famous being the Derryclare Butts: two stone piers that flank the mouth of the Inagh River where it flows into Derryclare Lough. Permits to fish on the loughs or river beats are issued to non-guests of the lodge on a space-available basis, and everyone is welcome to visit their gourmet dining room and cozy, oak-paneled pub. The lodge also rents rod, reels and equipment at their tackle shop, and offers a comprehensive selection of popular salmon and sea trout flies for sale. 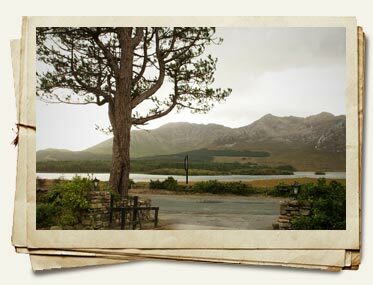 A short drive over the mountain pass north of Lough Inagh lies Kylemore Lough, a popular trout and salmon lake which forms the headwaters of the Dawros River. Ghillies, boats, permits are available from Nancy Naughton at the Kylemore House, a beautifully maintained Georgian house, built in 1785 by Lord Ardelaun. Richly decorated with antique furniture and art, retaining much of the original fixture and fittings, the drawing room was built for a 21st birthday party in 1907 and now resembles an art gallery with paintings and sculpture from a different place and time. Hosts Janet and Nancy, both born and raised in the house, offer a peaceful and comfortable stay in this guest accommodation. Immediately downstream from Kylemore Lake is the beautiful Kylemore Abbey and gardens, which are owned by the Benedictine sisters and home of a private school for girls. 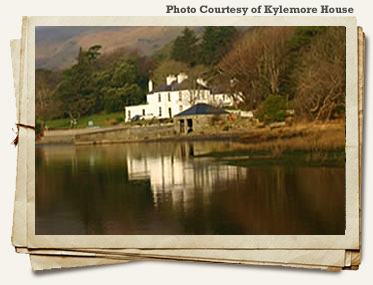 The Kylemore Abbey / Dawros River fishery consists of lake fishing in Castle Lake in front of the abbey itself, and river fishing on the prolific Dawros River that runs 5 1/2 miles from the abbey to the sea in the shadow of the Connemara National Park. Nigel Rush is the Dawros River fisheries manager, and he maintains an office in the parking lot for the abbey. He's generous with up-to-the-minute advice about fishing on the river, and can arrange for a ghillie with a little advanced notice. The Dawros is a deep, swift, weedy river that weaves through a foreboding forest of ancient Irish oak where it's easy to imagine goblins and other mystical creatures from Irish folklore hiding in the dense canopy of twisted, moss-covered branches that shade the river. The river is punctuated with deep runs and bends, and is fished from a well-maintained trail along the riverbank. Not far downstream from the abbey is the famous Rock Pool where you can cover the water efficiently from the many sturdy wooden casting platforms jutting out from both banks. It's not unusual to see salmon proposing intermittently while the resident brown trout – some quite large – rise to caddis and crane flies. The Delphi's Bundorragha River flows from the fabled Doolough on the northern fringe of Connemara into fyord-like Killary Bay. While only 1-1/2 miles in length, it features 19 named salmon pools, many of which were constructed from stone in the latter part of the 17th century. One of Ireland's most prolific salmon fisheries, and skillfully managed by the Delphi Lodge, the Bundorragha is famous throughout Europe with annual catches of over 500 salmon (550 in 2011). The lodge is also known for its successful salmon hatchery program, which supplements natural reproduction in the river with the release of thousands of fin-clipped smolts each year (and only fin-clipped returning salmon are allowed to be kept). 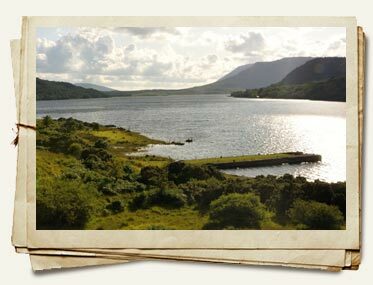 The luxurious and historic lodge is located on the shore of Furlough, a beautiful lake located in the middle of the system surrounded by some of Ireland's highest mountains. Although day permits to fish the Delphi are occasionally available, they cannot be reserved more than 48 hours in advance, and priority is given to guests of the lodge who usually book an entire week of fishing. The Erriff River and two connected lakes are managed by the Western Regional Fisheries Board, and both permits and comfortable accommodations are available at the adjoining Aasleagh Lodge Country House. Once a favorite of Lord Louis Mountbatten and British race car driver, Graham Hill, the Erriff flows through a rugged glacial valley and over a magnificent waterfall just before it empties into the sea. It offers eight miles of classic salmon pools and glides, nine beats, with a maximum of 2 or 3 rods per beat. This results in plenty of room for all anglers to spread out and fish undisturbed by their neighbor. Primarily a summer grilse river, the Erriff, like all Irish salmon rivers, has seen a marked increase in returning salmon since the drift net ban. The lodge is a luxurious Victorian country house that was formerly a pary of the Marquis of Sligo's estate and located on the banks of the river with a commanding view of Killary Harbor. Guests of the lodge are also invited to fish Lough Tawnyard, which holds good stocks of native brown trout – and migrating salmon in season. A smaller lake, Derrintin Lough, offers brown trout fishing, which can be done from its bank. The Owenglin River, which flows through the town of Clifden, offers excellent grilse fishing when in spate – and at a budget-friendly price. The fishery is managed by the Clifden Angling Association and permits are available from Stanley's fishing tackle shop located in town. The fishing is very good for the first eight miles upstream from town, and access is easy because the river flows in close proximity to the main Clifden/Galway Road. We particularly recommend spotting a car where the highway crosses the Owenglin just east of Clifden before driving upstream to the access at Crags Falls for a pleasant day of fishing through the many pools above and below the falls until you finally work your way back to the car left downstream. These fisheries are located in south-central Connemara and are owned and managed by the elegant Zetland Country House Hotel, which overlooks Cashel Bay. The Gowla fishery consists of two systems of lakes drained by the Owengowla River, which is 3-1/2 miles long with four beats accommodating up to eight rods. Both the river and Lough Oglala and Mannions Lough, where the hotel maintains boats for drift fishing, offer good fishing for salmon and sea trout beginning in June – and native browns all season long. 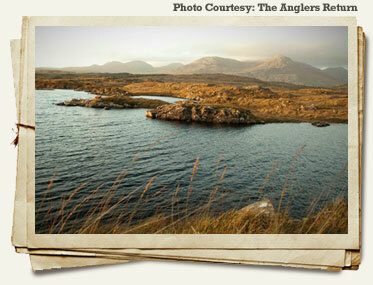 Boats are also kept on three loughs above Gowla Lough to offer a tremendous variety of angling opportunities. The neighboring Athry Fishery to the north, which drains into the Ballynahinch, consists of seven brown trout lakes, plus a special lake stocked with rainbow trout, with six boats available. This fishery also contains sea trout & salmon – and all lakes in the system have charge populations of native brown trout. There are 6 boats available. Please ask for details. The four-star Zetland Country House was built as a hunting and fishing lodge in the early 1800s and still carries on that tradition today with a gourmet kitchen and attentive staff. The hotel also owns some 17,000 acres of shooting rights woodcock and snipe hunting in the fall. A short drive farther to the east will take you to the Screebe Fishery, a privately owned chain of 16 lakes and interconnecting rivers with strong runs of salmon and grilse – augmented by their own, private hatchery. The rivers beats are spectacular with classic salmon pools and runs interspersed with fast water. The lower river also fishes well in low water when salmon come in with the tide. 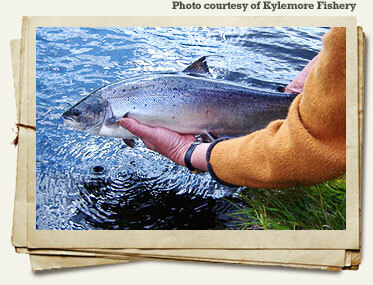 Traditonal lough fishing for native brown trout is also available on the lakes. This fishery is part of a 40,000 acre sporting estate that is also well known for its red deer, woodcock and waterfowl hunting in the fall. Luxury accommodations are available at the Screebe House located on the shore of Camus Bay. Built as a hunting and fishing lodge in 1865, this beautifully preserved Victorian gem is furnished in period antique furniture and features a large terrace with a magnificent view over Camus Bay. It offers eight rooms to accommodate up to fifteen people and a fully staffed gourmet kitchen. Lough Corrib is probably the most famous brown trout lake in all of Europe. Known as The Corrib, it's a 35-mile long limestone lake that's loaded with big brown trout that feed on continuous hatches from mid-April through the middle of June, and then on terrestrials from mid-August through the end of September. Permits are not required to fish for brown trout, but most anglers hire an experienced ghillie and boat in the angling centers of Oughterard, Cong, Cornamona, Headford, Knockferry or Annaghdown. Finally, on the northwestern outskirts of Galway City is the outlet for Lough Corrib where the "Weir" salmon beat on the Corrib River that runs through downtown Galway is one of the best in Ireland. A relaxing one-hour drive up the spectacular Erriff River Valley and through the bustling town of Westport will take you to Newport House, which overlooks the tidal estuary of the fabulous Newport River. This elegant, ivy-covered 200-year old Georgian country house is owned by Kieran Thompson, an avid fly angler and bird hunter, who holds fishing rights to all eight miles of the Newport River and the western half of Lough Beltra at the river’s source. All seven miles of the river are well-maintained with styles, bridges and clearly marked access – and the number of rods is strictly limited to assure an undisturbed day on the water. 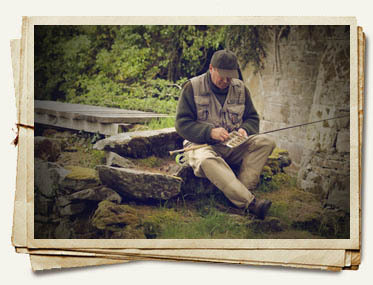 Fishing is done from the bank, so waders are not required – and only fly fishing is permitted. With strong runs of large (8- to 10-pound) spring salmon, runs of grilse and sea trout throughout the summer, and a smaller run of large salmon during September, the Newport with its 24 named pools is one of Ireland’s premier fly-fishing rivers. 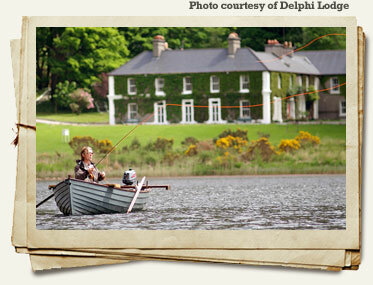 Lough Beltra is a wild Irish salmon and sea trout lough with boats and ghillies available from both the Newport House and the Glenisland Anglers Co-op. Two and a half miles long and a mile wide, the entire lake is restricted to fly fishing only (it’s possible to split a day of fishing between the river and lake). The Newport House’s fisheries manager, Eamon Kennedy, can outfit you with rods, reels and flies – and guide you on an adventure-packed day of fly fishing for trout and salmon, with a box lunch and a pot of tea, fresh-brewed from water boiled in a traditional Kelly Kettle. The hospitality at the Newport House is without peer. Their 18 bedrooms are spacious and comfortable, the high-ceiling reception rooms are warmed by open peat fires, a cozy bar offers premium wine, liquor and draft Guinness, and the dining room is the scene of hearty Irish breakfasts and gourmet dinners. The Newport House is also an ideal headquarters for easy day trips to the famous Moy River to the east, two fantastic spate rivers, the Owenmore and Glenamoy (which both produce salmon during and immediately following a heavy rain) to the north – or a tour of the south tip of Achill Island along the stunning Atlantic Drive.